If you have this image in your head of our three children sitting politely at the table, grinning, mmmm-ing and loving everything I make for dinner, let me clarify a thing or two. There are very, very, very few meals that everyone in our house enjoys. Jamey is my biggest fan and, thankfully, likes everything I make (or at least convinces me he does). Unless I use too much cilantro in something. He's not a fan of too much cilantro. Sam, at age 8, is my most finicky eater. He's very hard to please these days. Sadie keeps me guessing. Things I think she won't like, she loves. Things I think she'll love, she doesn't. But, overall, she's a good sport and queen of raw vegetables. Miriam isn't a huge fan of vegetables yet, especially the green ones. So she usually picks out the things she likes and leaves the rest on her plate. Unless there are cooked carrots or raw cucumbers. Those, she eats. But I am a stubborn, stubborn woman and it is more important to me that my kids try different foods a lot (and over and over) so they learn to eat a healthy variety of vegetables than it is that they don't complain at dinner. I mean, it's not that I like to hear the complaining. I don't. In fact, we've developed a system that works pretty well. Any complaining or arguing at dinner is a 10 minute earlier bed time. By the time they're headed for bed 20 minutes earlier than normal they hush up and eat. We don't require they clean their plates. We just want them to give the meal a decent chance. All this said...the other night we had a meal that included lots of vegetables that everyone (again, I say everyone!) liked. I think it was the cheese. Or maybe the corn (which was sweet, sweet, sweet). Or maybe it was the tortillas. Whatever it was, it worked. We had it two nights in a row and everyone ate it happily. How much filling you put in each tortilla will determine how much this recipe makes. The original recipe says it serves 6-8, but I was able to use 20 medium-sized tortillas over two nights (saving a couple each night for Jamey to take to work for lunch). The recipe below includes my changes and should last you two nights. The filling should be kept separate until ready for use the second night or can be stored in the fridge a few days or frozen until you're ready for round two. Saute onion, green pepper and garlic in a couple tablespoons of oil in a large saucepan or frying pan with a lid until they begin to soften. Add the corn, zucchini and cumin and cooked vegetables until they're tender but not browned. 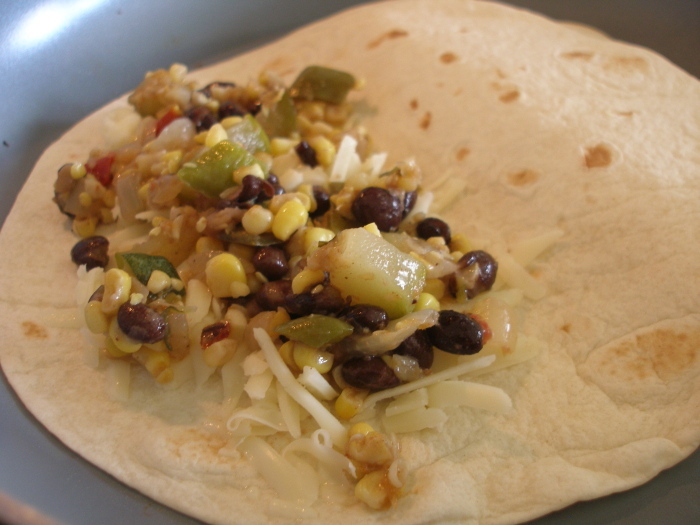 Add the black beans, broth and salsa and cook, covered, until the vegetables are soft. Remove the lid and simmer until most of the liquid has evaporated. Or, if you're pressed for time, pour the vegetables in a large colander to drain. So I made it for lunch and LOVED it. So did Brad. The kids weren't thrilled but they did eat them. Thanks so much for bringing this recipe to my attention. I will definitely be making it again! It's so nice when EVERYONE likes what you make, isn't it? Just stopping by to visit before I go *offline* for the next month or so. Have a fabulous summer with your family! Enjoy these beautiful days. Another great use for zucchini! I love it! That looks yummy! I'm going to have to try this! Your family sounds like mine with the food preferences. As I was reading this, I was thinking, "that sounds like my child #1, and that sounds like #2".